With the fast-growing online industry, including online gambling, shopping and money transferring many new and alternative online payment options has appeared. All of the online payment solution companies are catering for customers' needs and tastes. UseMyWallet is one of the easiest and quickest ways to make online money operations. This e-wallet has become the favorite financial service for many people nowadays. The registration process is simple, you just need to register at the one of the online casinos accepting UseMyWallet and wait for an invitation, which will be sent to you via e-mail. It can take up to five days. Right after the invitation is received, you can use the high quality UseMyWallet service. UseMyWallet account holders are sure to make safe and secure transactions as they are protected with the latest software technologies. UseMyWallet is a very secure online account that can be funded with the help of the user's checking account or Visa credit card. The first method is completely free and can take up to 4 days, while the second will take 5% fee for depositing via credit cards. 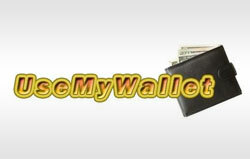 It is important to note that UseMyWallet is an online account specially designed for the US clients only. In order to become a holder of UseMyWallet account a person should be a member of the online casino no less than 3 months and make at least 500$ deposits during that time period. 500$ is the UseMyWallet limit for depositing. UseMyWallet supports various currencies, for example, Euro, US dollar, Danish Crones, Swiss Francs and Israeli New Shekels. The withdrawal can be made only with the help of Wire transfers and it will take up to 7 working days. In addition to that, UseMyWallet has 20$ and 30$ fees for funds cashing.